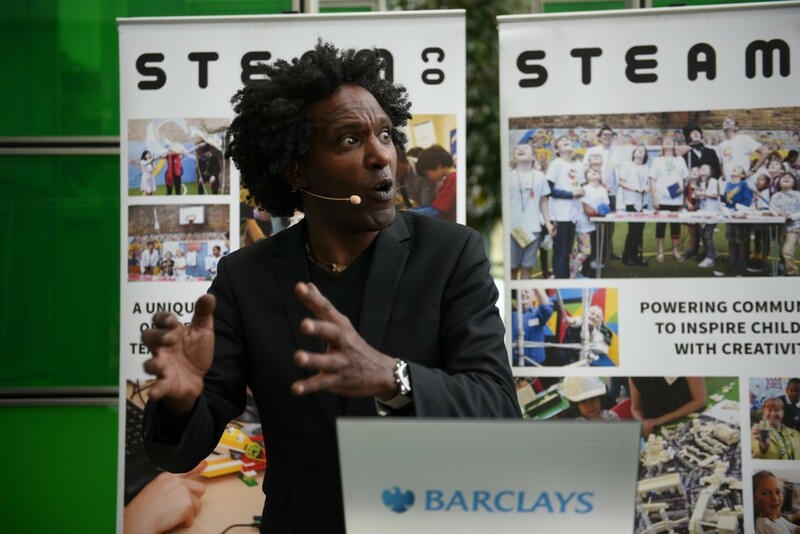 Barclays Blue Sky — STEAM Co.
Short talks by a wide range of inspiring and generous people: Lemn Sissay MBE, Ashok Vaswani, Martyn Ware, Marva Rollins, Mark Earls, Prof Pam Burnard, Robin Wight, Susan Coles, Mark Earls, Jaz Ampaw Farr and many more for a milestone #creativity event. Yes. In a bank. Trad .v. prog. Left .v. right. Black .v. white? Enough of these extremes! We thought we needed some middle ground, some blue sky thinking, talking and DOING. So we held an evening gathering of like minds up in the clouds. An evening of short talks and huddles to celebrate creativity and how it can inspire children, innovate business and connect communities. We had over 20 speakers giving 2 - 5 minute talks. 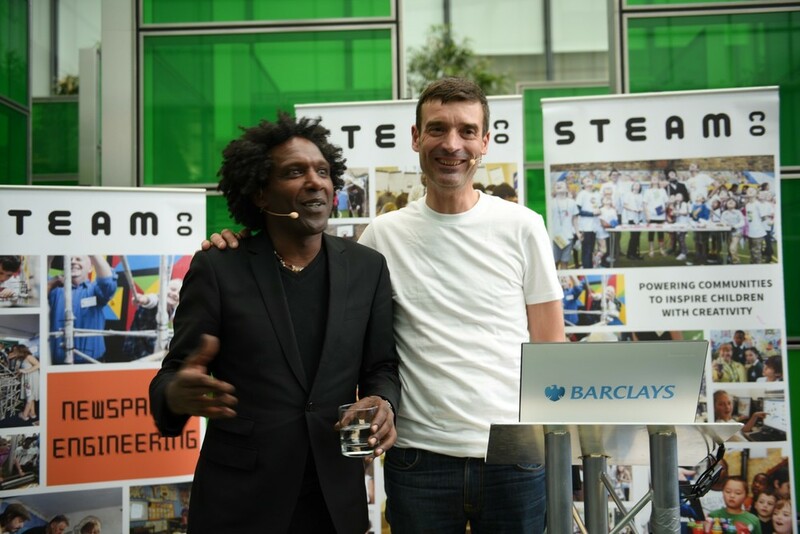 "Creativity is not the monopoly of artists", said Lemn Sissay. "We don't have a CSR strategy, this IS our business" said Ashok Vaswani, CEO of Barclays. Creative Britannia may not be very cool any more, as a phrase anyway, but no one’s going to question the value of creativity to the economy, contributing £77 billion of direct GVA to UK Plc at the last count, enriching lives at home and abroad in the process. 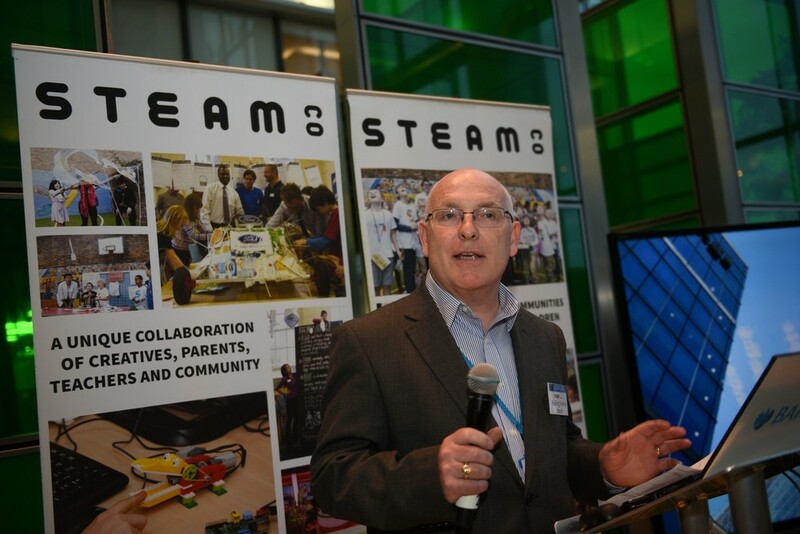 But all this starts in our schools, in primary schools and STEAM Co. is passionate about bringing communities into primary schools. To inspire children with creativity. To work with hard pressed teachers. 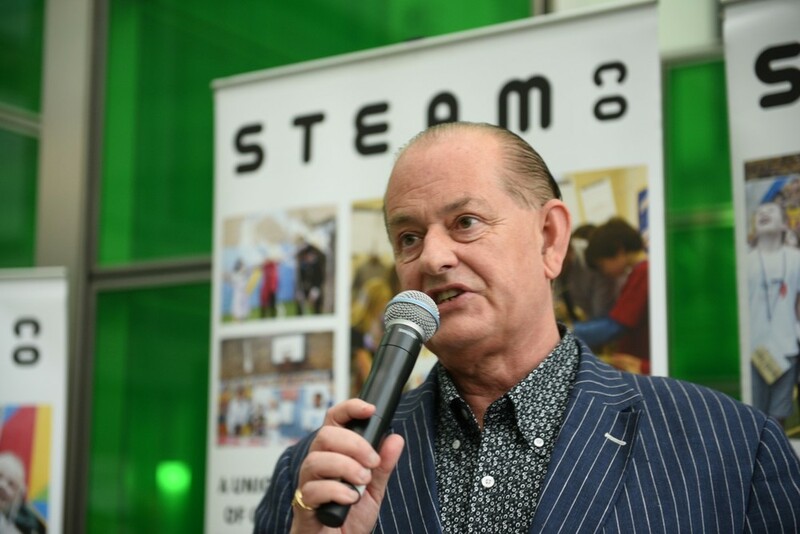 If we’re going to roll STEAM Co. Days out to every primary school across the UK, we’re going to need some help, to make a few friends and to connect a few people. So when one of our launch sponsors, Barclays, offered us the use of the conference facilities on the top floor of their skyscraper in Canary Wharf to get a few people together for an evening, we bit their hand off. Oh yes. 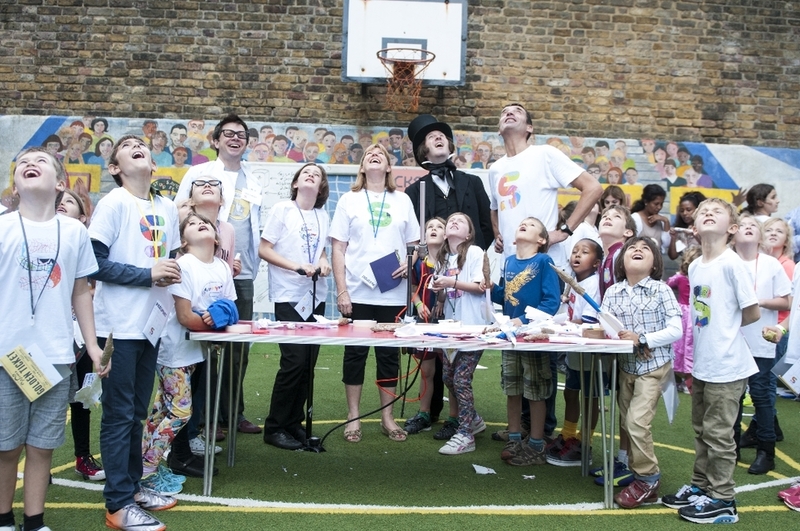 We had a line up of very short 2 minute soap box talks by the most inspiring people – creatives, technologists, teachers, parents and business people – all united by one thing; a passion and belief in the importance of creativity, for #allourfutures. The film below includes all talks from the evening, kicked off by Co-founder of STEAM Co. Nick Corston who explained the rational behind calling it an evening of #BlueSkyDOING . WHO CARES IN CARE HOMES, OR SCHOOLS? "In creativity I saw light. Creativity is not the monopoly of artists"
"Forget polarised extremes, it's time for blue sky thinking and talking, or #BlueSkyDOING"
"Unlike the agricultural and industrial revolutions, we're leaving no one behind"
"We're looking at pedagogies to use STEAM to work and learn and teach our children"
"When he had the choice of cutting budgets for tanks or the arts Churchill said..."
"As an Inspirator I'm announcing a collaboration with TechWillSaveUs"
Is creativity really for everybody? "We have the 10% poorest people in the UK. Our community is broke but not broken"
"A network of two or two hundred. I doesn't matter. Go away tonight and do more"
"We have to engage parents, the biggest influencers and the biggest dissuaders"
"How much creativity is going to waste because it's not recognised? "I showed the family scooter at the UN where I've just launched 'Little Inventors' globally"
Can creativity bring us together? "We think about creativity as a solo game but it's mostly about using the brains of others"
"Brilliance isn't taught, it's caught. Le's teach our children there's greatness within them"
"Sensorium: a collaboration between 30 students in 11 countries and 14 disciplines"
"Improv is disposable theatre. I feel schools should put it on the curriculum"
"I see myself as a curator of my children's educator, more than as a teacher"
Flick through the stunning photos of the evening below by Mark Hakansson. Take a look at this film to see the great work that Barclays are doing in the community with the 15,000 Digital Eagle volunteers they've trained up to help children and adults navigate this digital world from coding to using the web. They're also partnering with the BBC, Microsoft and Samsung to help roll out the BBC Micro:bit and building a network of Eagle Lab maker spaces across the UK in disused bank branches. We wrote a blog post about our work with Barclays, but Dave Shepherd hit the nail on the head when he said "In this digital world, it's all about people". We're so grateful to Barclays for their generosity here but it's worth noting they have a track record of backing pioneers and pioneering projects like this. They helped fund the world's first steam railway, the Stockton & Darlington in the steam powered revolution back in 1825. And here they are backing the STEAM revolution today. 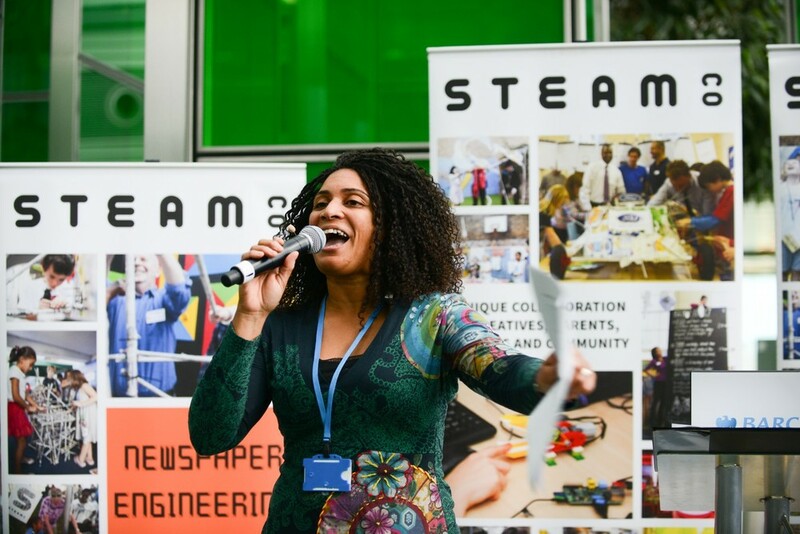 If you or your company or organisation would like to work with or support STEAM Co. do get in touch via the sign up form on our home page. THANK YOU TO ALL THE GENEROUS PEOPLE AT BARCLAYS, STEAM CO, AND BEYOND WHO MADE THIS INSPIRING EVENING HAPPEN.